It is the first time the composition of the seafloor, covering 70 percent of the Earth's surface, has been mapped in 40 years; the most recent map was hand drawn in the 1970s. "In order to understand environmental change in the oceans we need to better understand what is preserved in the geological record in the seabed," says lead researcher Dr Adriana Dutkiewicz from the University of Sydney. "The deep ocean floor is a graveyard with much of it made up of the remains of microscopic sea creatures called phytoplankton, which thrive in sunlit surface waters. The composition of these remains can help decipher how oceans have responded in the past to climate change." A special group of phytoplankton called diatoms produce about a quarter of the oxygen we breathe and make a bigger contribution to fighting global warming than most plants on land. Their dead remains sink to the bottom of the ocean, locking away their carbon. The new seafloor geology map demonstrates that diatom accumulations on the seafloor are nearly entirely independent of diatom blooms in surface waters in the Southern Ocean. "This disconnect demonstrates that we understand the carbon source, but not the sink," says co-author Professor Dietmar Muller from the University of Sydney. More research is needed to better understand this relationship. Dr Dutkiewicz said, "Our research opens the door to future marine research voyages aimed at better understanding the workings and history of the marine carbon cycle. Australia's new research vessel Investigator is ideally placed to further investigate the impact of environmental change on diatom productivity. We urgently need to understand how the ocean responds to climate change." Some of the most significant changes to the seafloor map are in the oceans surrounding Australia. "The old map suggests much of the Southern Ocean around Australia is mainly covered by clay blown off the continent, whereas our map shows this area is actually a complex patchwork of microfossil remains," said Dr Dutkiewicz. "Life in the Southern Ocean is much richer than previously thought." 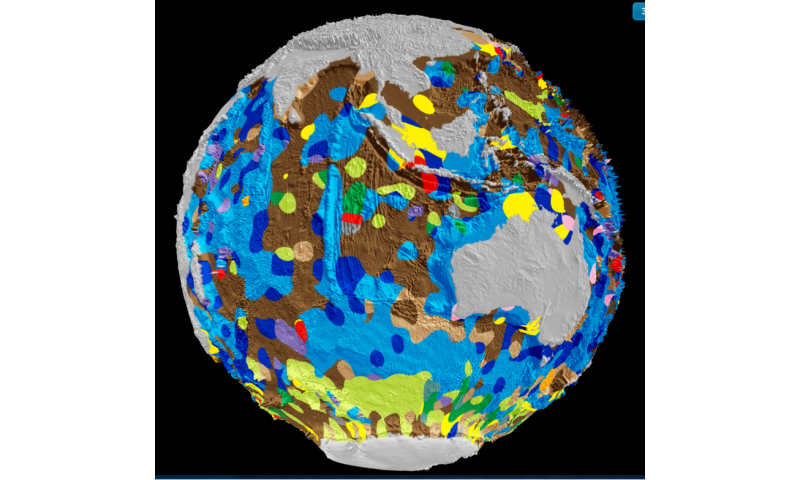 Dr Dutkiewicz and colleagues analysed and categorised around 15,000 seafloor samples - taken over half a century on research cruise ships to generate the data for the map. She teamed with the National ICT Australia (NICTA) big data experts to find the best way to use algorithms to turn this multitude of point observations into a continuous digital map. "Recent images of Pluto's icy plains are spectacular, but the process of unveiling the hidden geological secrets of the abyssal plains of our own planet was equally full of surprises!" co-author Dr Simon O'Callaghan from NICTA said.